The protesters were welcomed warmly by the citizens of La Paz but treated with a combination of hostility and indifference by the government of indigenous president Evo Morales. The government refused to dialogue directly with the march leadership, which it has consistently sought to discredit, and barred the protesters from the Plaza Murillo where the seat of government is located. They were tear-gassed and sprayed with water cannons on two occasions. Government officials did meet and pact with several dissident march contingents, who agreed to abandon the protest in exchange for promised community benefits. Plagued from the start by poor logistics and inadequate provisions, the march was further debilitated by La Paz’ harsh winter climate that took a special toll on women and some 300 children who participated in the La Paz mobilization. On July 3, the Morales government signed an agreement with 45 (out of 63) indigenous TIPNIS authorities in support of the consulta, which appeared to thoroughly marginalize the protesters. Then, on July 10, the leadership of CIDOB, the lowlands indigenous federation that sponsored the TIPNIS march—including its president Adolfo Chávez—was replaced at a hastily-organized general assembly by a pro-consulta slate, an act that appeared to seal the fate of the TIPNIS protest. For Interior Minister Carlos Romero, who described the march as a “failed mobilization from the start,” the marchers’ return provides an opportunity for the government to begin a “real dialogue” with the 63 indigenous TIPNIS communities through the consulta that is scheduled to begin July 29. But TIPNIS leaders have vowed to resist the consulta through a variety of tactics, including barring access by government teams to the rivers that traverse the territory. Leaving La Paz. 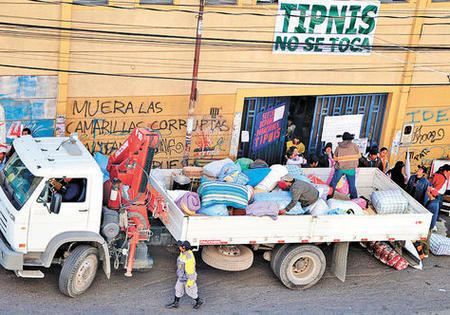 Credit: La Razón.“The struggle isn’t over,” says TIPNIS leader Fernando Vargas, “we’re just taking it back to our communities.” A judicial complaint under a provision of Bolivia’s constitution that safeguards environmental and patrimonial rights is also being considered. Originally, the marchers objected to the consulta primarily because it would take place after fundamental decisions affecting the road had already been made. This concern has been substantially tempered by the government’s rescission of Brazilian firm OAS’ construction contract, and the corresponding loss of Brazil’s construction financing. In any case, Bolivia’s Plurinational Constitutional Tribunal has recently upheld the “ex post facto” nature of the consulta, on the grounds that even projects already underway should be subject to challenge and potential reconsideration. But the Tribunal has conditioned the constitutionality of the consulta on the government's ability to carry out a planning and implementation process in good faith, with the confidence of all parties, to achieve consensus. 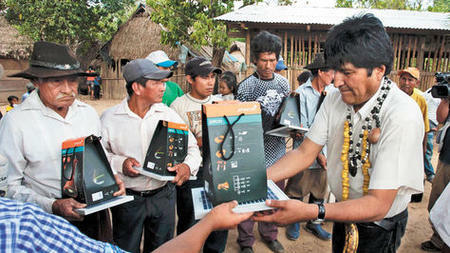 According to anthropologist Xavier Albó, “we are far from complying with the conditions that would make the consulta previa constitutional.” Morales delivers communications equipment in the TIPNIS. Credit: La Razón. Rather than demonstrating community consensus, Albó argues, the consulta protocol has only achieved a sign-off by indigenous leaders, some more legitimate than others. According to Fernando Vargas, only 18-20 of the 45 signatories are authentic community representatives. Of the 63 communities that are required to be consulted, says Albó, 13 are located inside “Polygon 7,” an area of the park dominated by pro-road coca growers which is outside the indigenous territory. While originally settled by lowland indigenous groups who are the intended subjects of the consulta, these communities have relinquished their collective land title, shed their native customs, and do not satisfy the “double category” standard of belonging to both the national park and the indigenous territory, as required by the consulta law. Ombudsman Rolando Villena. 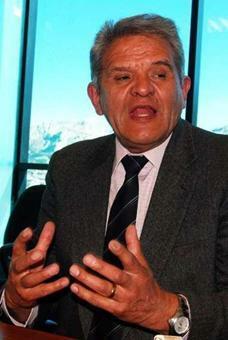 Credit: Fredd Ramos, Página Siete.In Albó’s view, the Morales government’s coincidental distribution of handouts to TIPNIS communities at a time when it is seeking their support for the consulta, its determined campaign to discredit lowland indigenous leaders, and its maneuvers to replace legitimate community authorities constitute egregious acts of bad faith which have exacerbated, rather than ameliorated, the TIPNIS conflict. TIPNIS leaders hold the Morales government directly responsible for creating (and subsequently recognizing) a “parallel CIDOB,” which they claim has the legitimate support of only 5 of 13 regional affiliates. What lies ahead for the TIPNIS conflict is anyone’s guess. A recent poll in Bolivia's four largest cities shows that 43% favor the consulta, while 38% support the marchers’ demands against both the TIPNIS highway and the consulta. Bolivia’s Ombudsman has called for a postponement of the consulta, to avoid the risk of serious confrontations, comply with the Constitutional Tribunal’s mandate, and establish a process that is both legitimate and legal.